USSbriefs launches today to provide a better understanding of the USS pensions dispute. In our view, the many dimensions of the dispute have together created a sense of crisis in the British Higher Education sector, and the pace of developments has left many university staff feeling uninformed or confused. USSbriefs is a platform for academics to explain key aspects of the crisis in a way that can easily be understood and shared. Its launch is especially timely as UCU is about to issue an e-ballot to members on whether to accept the latest offer by the employers federation and call an end to the unprecedented programme of strikes the union has called this spring. The offer has divided opinion among the membership. The initiative developed on Twitter during the current industrial action. Academics have turned to social media to combat the often superficial and inadequate information being circulated. Many group members have led the way in circulating information and informing debates in the course of the dispute. USSbriefs builds upon that expertise and provides timely guidance that can be shared more widely among UCU members. 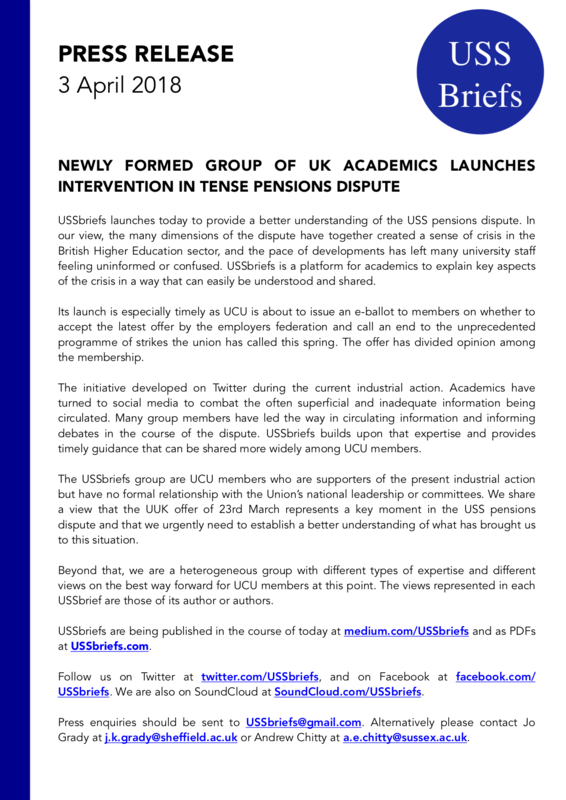 The USSbriefs group are UCU members who are supporters of the present industrial action but have no formal relationship with the Union’s national leadership or committees. We share a view that the UUK offer of 23rd March represents a key moment in the USS pensions dispute and that we urgently need to establish a better understanding of what has brought us to this situation. Beyond that, we are a heterogeneous group with different types of expertise and different views on the best way forward for UCU members at this point. The views represented in each USSbrief are those of its author or authors. USSbriefs are being published in the course of today at medium.com/USSbriefs and as PDFs at USSbriefs.com. Follow us on Twitter at twitter.com/USSbriefs, and on Facebook at facebook.com/USSbriefs. We are also on SoundCloud at SoundCloud.com/USSbriefs. Press enquiries should be sent to USSbriefs@gmail.com. Alternatively please contact Jo Grady at j.k.grady@sheffield.ac.uk or Andrew Chitty at a.e.chitty@sussex.ac.uk. Download this Press Release as a PDF, or as a PNG. At the time of this Press Release (3 April 2018), none of USSbriefs members had formal relationship with UCU’s national leadership or committees. As of 3 December 2018, some USSbriefs members now hold position in UCU’s national committees. All members who continue to contribute to the development and dissemination of USSbriefs do so as individuals and not as representatives of any committee or other group.